I don’t believe that I’ve ever posted twice in one day before, and I certainly didn’t plan on a second entry after this morning’s 1,600-word romp. However, a tidbit on Broad and Pattison today caught my attention, and I felt compelled to make sure that I used it in a timely and appropriate manner. Apparently, on this date in 1982, Jay Baller made his Major League debut, pitching a perfect 8th inning in a 8-1 loss to the Pirates. Almost certainly best known for being one of the five sent to the Cleveland Indians in the trade for Von Hayes, he never actually played in a game for them. 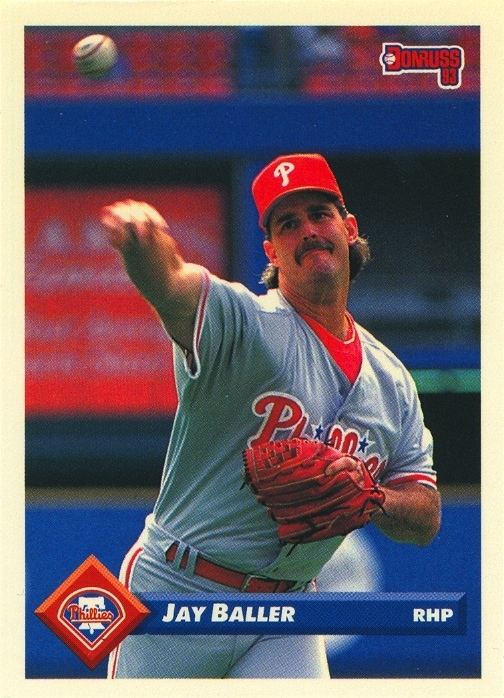 He only provided 11 innings over eight games in his brief second tour with the Phillies in 1992, but those meager innings resulted in his first and only Phillies card appearance. I’m sure that if the Bowman line, as Topps handled it during the ’90s, was around in the early ’80s, then starting in 1980 Topps would have issued a a plethora of Phillies cards of him. As it was, he only appeared in three other mainstream issues during his career. Nonetheless, thanks to the Von Hayes trade, he holds a place in Phillies lore, which means that 29 years after his big league review, people still write about him and post scans of his baseball cards.